Have a question for Haeya Boutique Hotel? 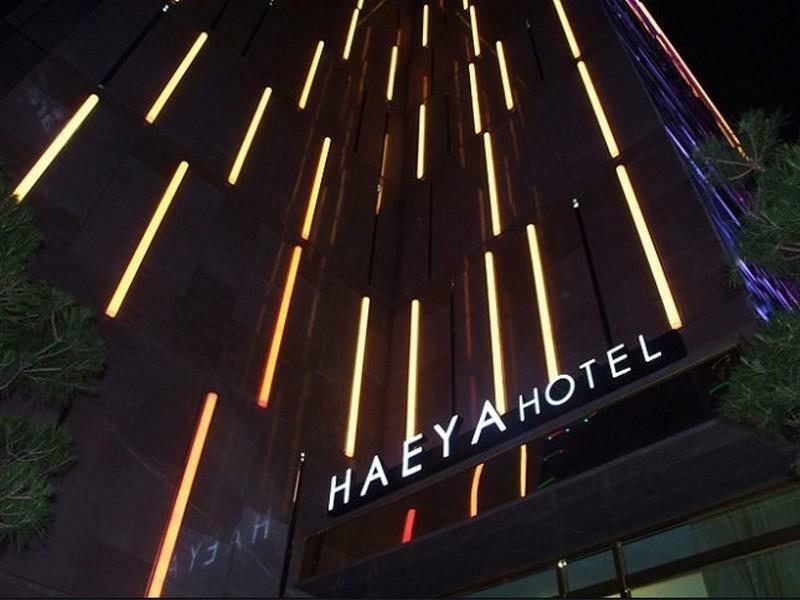 If what you're looking for is a conveniently located hotel in Ulsan, look no further than Haeya Boutique Hotel. From here, guests can enjoy easy access to all that the lively city has to offer. With its convenient location, the hotel offers easy access to the city's must-see destinations. At Haeya Boutique Hotel, every effort is made to make guests feel comfortable. To do so, the hotel provides the best in services and amenities. To name a few of the hotel's facilities, there are free Wi-Fi in all rooms, 24-hour front desk, facilities for disabled guests, Wi-Fi in public areas, car park. Step into one of 57 inviting rooms and escape the stresses of the day with a wide range of amenities such as television LCD/plasma screen, internet access – wireless, whirlpool bathtub, air conditioning, heating which can be found in some rooms. The hotel offers many unique recreational opportunities such as hot tub, golf course (within 3 km). Superb facilities and an excellent location make the Haeya Boutique Hotel the perfect base from which to enjoy your stay in Ulsan. "Spacious and clean room, good location"
This hotel is in a strange area, not really convenient unless you are taking the slow train to Busan, which I did. It's across the street from Taehwagang station. There are dozens of hotels and motels on this street. Haeya doesn't stand out particularly. Once in the room however it is fine. A big bright room with a view of the station and mountain (I guess other rooms face other ways), a huge comfortable bed, all the amenities, but especially the bath: the toilet has a heated seat, there is a standing rain shower stall and a Jacuzzi hot tub with a second shower. The room was warm, it has a fridge, TV, internet, a work table and all you need (though curiously I could only find one available power source to plug in my phone; all the outlets are hidden by built-in furniture that you cannot move). The man at the front desk brought me up to the room and showed me how the heater and lights work. There is a breakfast upstairs but since it ends at 9am I didn't get there in time. Very spacious room and huge bathroom with a whirlpool bath. It's kind of a love motel style but it's not trashy in any way and would definitely stay here again if back in Ulsan. Breakfast was a bit unusual - just cereal, toast, and a fried egg with some random salad selection - but it was better than nothing. Does place does as much as they can to make their customers happy. Free laundry service and breakfast for those interested. Parking was plentiful. Would definitely go back if I were in the area. Would also highly recommend 더펜, personal chef restaurant just behind the hotel! Room is spacious; bed sheet and quilt are comfortable. The massage bath container is not too clean. 모텔촌 사이에 살짝 당황스런 위치였지만 넓은 객실에 넓은 자쿠지는 좋았습니다. 아침 조식은 주방이모가 후라이 해 주십니다. 울산 남구청 근처라 교통은 좋지만 주변에 유흥가가 많아서 비지니스 목적으로 묵기엔 보통입니다. 태화강역 바로 맞은편에 있고 방은 되게 널찍하고 햇빛이 잘 들어왔어요. 위생상태도 깨끗했어요. 근데 조식먹으러 갔는데 일요일 아침은 한식은 안되고 토스트,씨리얼,계란만 된다고 하더라구요. 조식은 별로 추천하지 않습니다. 다른방에서 나는 담배냄새 제대로 환기 못시킬꺼면 화장실에 문을 제대로 달아 놓으셔야죠... 환풍기 켜면 시끄럽고 끄면 담배냄새 들어오고.. 숨막히고 피곤한 밤이네요..
크리스마스 이브에 하룻밤 잘 보냈습니다! 숙소 컨디션도 좋았고- 위생상태도 청결했어요.. 조식도 맛있었구요.. 다만 위치가 번화가랑은 좀 떨어져 있어서.. 그것빼곤 다 좋았습니다! 조식만 아니면 비쌀 이유가 별로. . 유흥가 주변이라 가족끼리가면 거리입구에서 놀라구요. 방은 넓어요 져가 이용했던 방은 4명이 자려면 3명이 한 침대써야되더라구요. 샤워실 문 없는건 진짜 에러!! !